"Oz Clarke: Grapes & Wines"
What do you taste in wine? Why do you taste it? Where does it come from? Oz Clarke says it best: “If we have any interest in wine and in flavours, we have to be interested in the grape variety itself.” That’s how more and more consumers think and learn about wine today, and Clarke, one of the world’s most renowned wine writers, has created the definitive guide on for wine lovers who want to know more. In his usual accessible and appealing style, Clarke appraises the world's greatest grapes and the wines they make, looking at the history, the places, the people, the various wine types, and the diversity of flavors to enjoy. 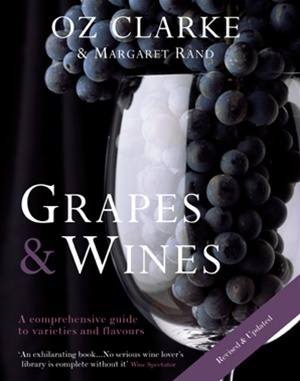 Oz Clarke: Grapes & Wine won the prestigious Lanson Wine Book of the Year award, and this updated edition is once again the most helpful, thorough, and readable look at the subject. Known for his phenomenal palate, accurate predictions, and enthusiasm, Oz Clarke is Britain's best-known wine writer and the author of a collection of best-selling wine books. He has won all the top wine writing prizes, both in the UK and the US, including the Lanson Special Millennium Award for his outstanding contribution to wine communication and education and the prestigious International Wine and Spirit Communicator of the Year Award.